This service is designed for local city usages. It is available online on our official website. The Local Full Day service will be available for a variety of local trips including sightseeing, shopping, attending meetings, seminars, visiting hospitals, and a lot more. Special arrangements are made for group packages from Ladakh to places nearby. The cars sent across will easily accommodate group size to ensure maximum convenience. The to and fro service in Ladakh is available for multiple destinations from Ladakh. The one way service is the best option for those looking forward to avail one way drop to their destinations from Ladakh. This is a special package designed only for travellers visiting multiple cities within a predetermined period of time. The packages listed above are designed keeping in mind specific requirements of Ladakh travellers. We also offer special Ladakh city sightseeing tours and any other customized cab rental packages. 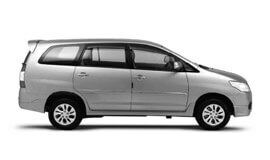 At My Taxi India, we guarantee the best car rental services in Ladakh at highly affordable prices. The climate of Ladakh is extreme. The summers are a little harsh with direct sunlight that falls at a high altitude. The winters can very cold with temperatures dropping below freezing point. The best time to visit Ladakh is during the months of May-September. According to official Census report, Ladakh enjoys a population of about 260,000. The economy of Ladakh comes from three major places; the Indian Army, tourism, and civilian government such as jobs and extensive subsidies. Agriculture contributes to minor part of Ladakh’s total revenue. Ladakh, also known as the "land of high passes" is a region in the state of Jammu and Kashmir, India. It is also the largest of the ten provinces of Jammu and Kashmir and enclosed by the Karakoram chain of mountains in the north as well as Himalayas in the south. There are mny interesting places to visit in Ladakh including Hemis Monastery popular for gigantic painting of Buddha displayed only once in 11 years to the public, Thiske Monastery, Gompas in Ladakh, Alchi, Likir, Lamayuru, Sankar Gompa, Alchi, Dah, Hanu, Nubra Valley, 'Shangri La', Karakoram Pass, Tso Morari Lake, Pangong Tso, Kyaghr Lake, and Hemis Wildlife Sanctuary.